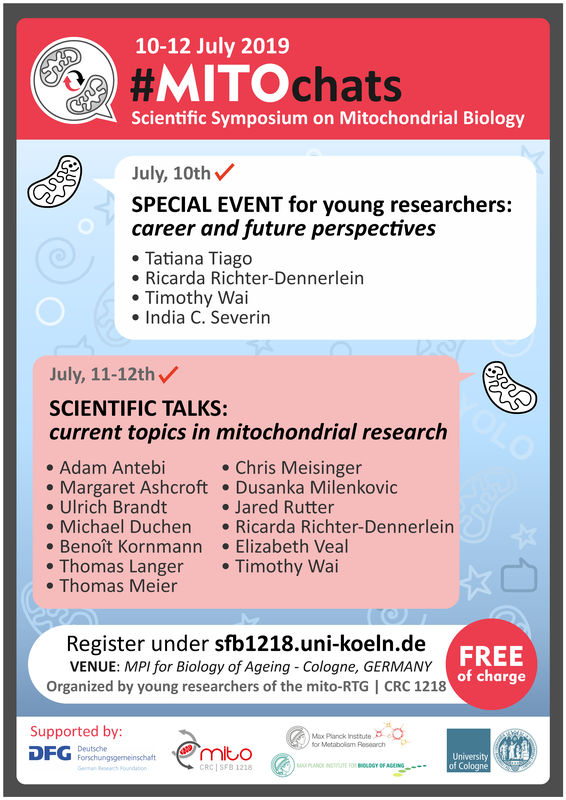 1st mito-RTG organised Summer Symposium on Mitochondrial Biology "MITOchats"
to be held in Cologne on July 10-12, 2019.
in Cologne. We are pleased that excellent, international speakers accepted our invitation and we would be happy to welcome you in Cologne. The first day of the event, 10.07.2019, is dedicated to young researchers only. Young scientists will have the chance to hear career experiences of invited speakers from academia and industry and join the discussion in a “PI-free” atmosphere. 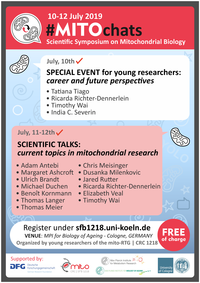 On 11.07. and 12.07. internationally renowned scientists and a number of selected participants will present their recent data on current topics of mitochondrial biology to an international audience. All interested scientists are cordially invited to join our international mitochondria-research community to have some fruitful “MITOchats”. More information about the programme will be announced soon.